If you haven’t been to Alpe d’Huez (ADH) before then there is an awful lot to read and digest in order to fully appreciate why ADH is a MUST-GO ski resort.Winner of the ‘Best Ski Resort in Europe 2017’ Award but it could easily win it most years and there are plenty of reasons to back this up. Ever heard of Tomorrowland?One of the worlds largest music festivals, it started in 2005 and has the very best and famous Electronic Dance musicians such as David Guetta, Avicci and the Swedish House Mafia to name a few.In 2019 though, Tomorrowland has made the decision to be hosted for the first time by a Ski Resort and where did it choose?Yes you guessed it, Alpe d’Huez.For a week next winter the town, the bar, the piste and the off poste will be rocking to the sounds of Electronic Dance. The Sarenne Glacier:Starting from the Pic Blanc at 3330m, a sea of ice flows down towards the Sarenne Gorge.You want a snowsure resort!Well ADH is exactly that.The Marie hasn’t rested on his laurels though and in 2016 the Marie’s Office commissioned the addition of snow-cannons to the lowest part of the gorge, meaning that the entire 17km Sarenne Glacier run is snow covered once the season gets underway.Graded as Black it’s the longest black run in Europe, but in reality its only the top section that’s black, most of the run down is a mixture of red, blue and green. Skiing in France – where should you holiday next? Ok so we all know it has been a slow start to the 2015 ski season in Europe. 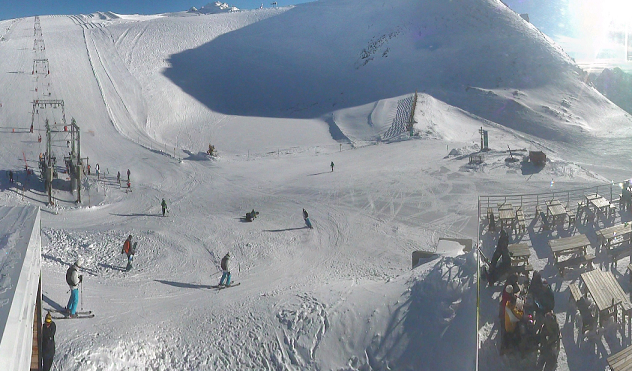 The warm and dry conditions made slopes look a little too green in some Alpine resorts over Christmas and New Year. But winter always arrives and early January has seen some big dumps across the main French resorts. So if you haven’t yet booked your next ski holiday don't worry as there is still 3 months of skiing in most resorts. In an unexpected and somewhat surprising move the Swiss central bank has removed the currency supports between the Swiss Franc and other foreign currencies. This prompted chaos on currency markets yesterday with some financial firms even going bankrupt as a result. The bad news for the financial markets is also bad news for anyone planning a ski holiday in Switzerland. With the currency rising almost 30% against both the euro and sterling the price of everything in Switzerland just got 30% more expensive. Due to a recent change in local labours laws Swiss ski resorts are already seeing reduced interest from UK ski holiday companies and as a result less UK skiers and snowboarders. This new hit of an additional 30% price increase is not what the local ski industry needed just now. 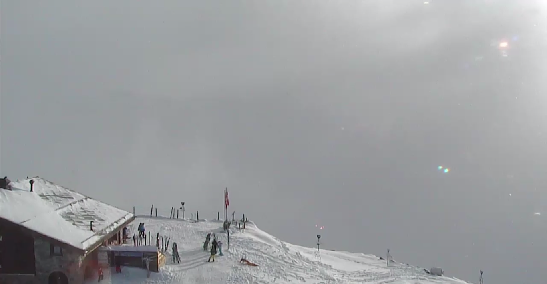 Only time will tell but it seems that Swiss ski resorts might be looking a little quieter for the foreseeable future. 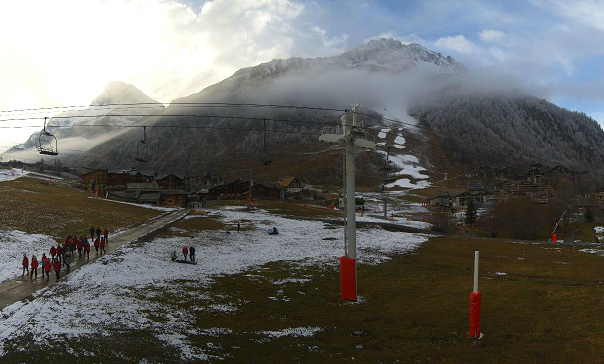 It looks like winter has finally arrived in the Alps. Up to 70cm of snow has fallen in 24 hours and while the snow is more than welcome it has caused travel problems across the region. The worst of the travel chaos is in France and Switzerland where it snowed very heavily on Saturday. The snow storm is now moving eastwards across Austria although it is gradually loosing strength. Needless to say the snow has been very welcome in resorts across France which were suffering from a lack of snow so far this season. Many resorts which were closed or had only partially open runs will now be able to open fully for the busy New Year period. Val d’Isere saw some of the biggest dumps with 70cm of powder, Meribel and Verbier had 55cm and Les Gets saw some 30cm. Traffic conditions on the French motorways are particularly difficult and all travellers are adviced to use extreme caution when driving. At Chambery airport heavy snow forced British skiers and snowboarders to seek emergency accommodation as travel was disrupted. Despite the travel problem even one in the resort is more than happy to finally see a good amount of fresh snow. With a drought of snow during December most resort had been relying on artificial snow on high altitude runs. This dump will finally see most resorts fully and just in time for the ski holidays. Roll on the winter season. And now. What a change !!! With the season just barely kicking off we already have one of the most amazing ski videos of the year. Watch Cody Townsend straight line the couloir know as The Crack in Tordillo Mountains in Alaska. The chute is so narrow it is hard to believe that someone can actually fit through the gap, not to mind doing it while skiing at over 70 km/h. This is one ride you definitely don't want to mess up. With the launch this week of Spectre, the latest James Bond film, is seems like the charming secret service agent is getting back on skis. Earlier this week director Sam Mendes revealed that the latest film will be produced in Pinewood Studios and shot on location in London, Mexico City, Rome and Tangier and Erfoud, in Morocco. Mr Bond will tackle the snow once again, this time in Solden and also in Obertilliach and Lake Altausse in Austria. It will be interesting to see Daniel Craig’s technique on skis but for sure it will be hard to beat the classic ski chase from The Spy Who Loved Me. Interestingly this was also shot in Austria in 1977 with Roger Moore as the star. Could the yellow onesie make a comeback ? Of course skiing, snow mobiles and indeed general mountain craziness has always been part of the Bond stable of tricks. And Pierse Brosnan also showed us his off piste skills in The World Is Not Enough (1999). If you are a Bond fan and would like to time you ski holiday around the same time as the filiming then you should check out these dates. According to the Solden Cable Car company the expected times of fiming for the Spectre movie are as below. There may be road closure and lift delays at certain times. 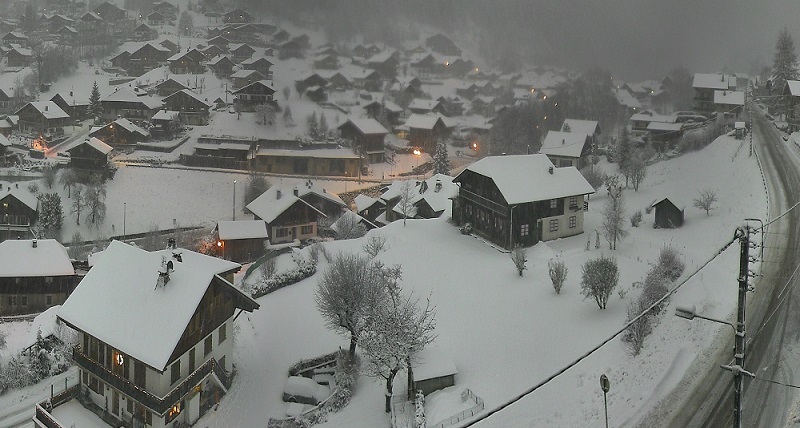 It has been a slow start to the snow in Europe this season. Despite a reasonable fall of snow in many Alpine areas during November the warm weather has meant that lots of pistes are looking at little too green for this time of year. Some resorts which were due to open this weekend have been forced to cancel due to poor snow cover. Courchevel, Meribel and Les Menuires announced that they would not be opening as planned this weekend. 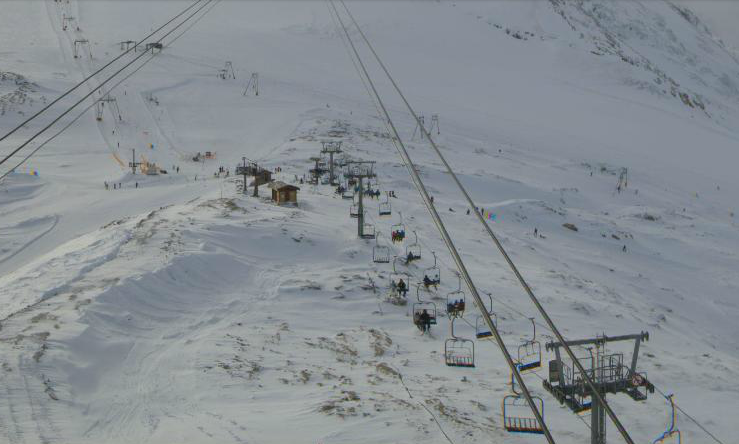 Tignes and Val d'Isere are open but only at the higher altitude glacier sections. Val Thorens in Les 3 Vallees is also open but with reduced runs and terrain. Both Alpe d’Huez and Les 2 Alpes are partially open with reasonable skiing at the higher levels. Some of the best conditions at the moment are in Switzerland where the November snow in Zermatt and Saas Fee is sticking will and conditions at the higher altitude runs are reasonable for this time of year. 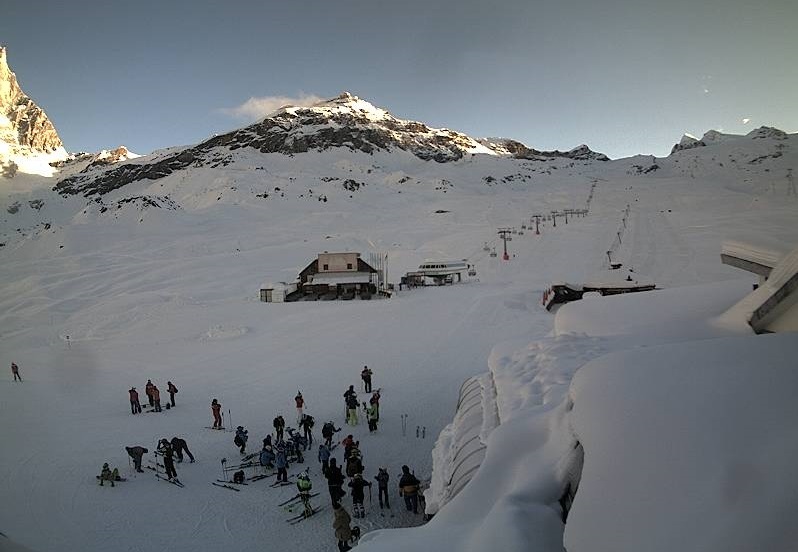 The high runs across in Cervinia are also skiable at the moment. Of course the very best conditions are in North America where the recent snow storms have ensured excellent coverage. Don’t worry too much, it is still very early in the season and as many experienced seasonaires will tell you “the snow always comes”. Let’s hope so and we will keep you posted when it does. 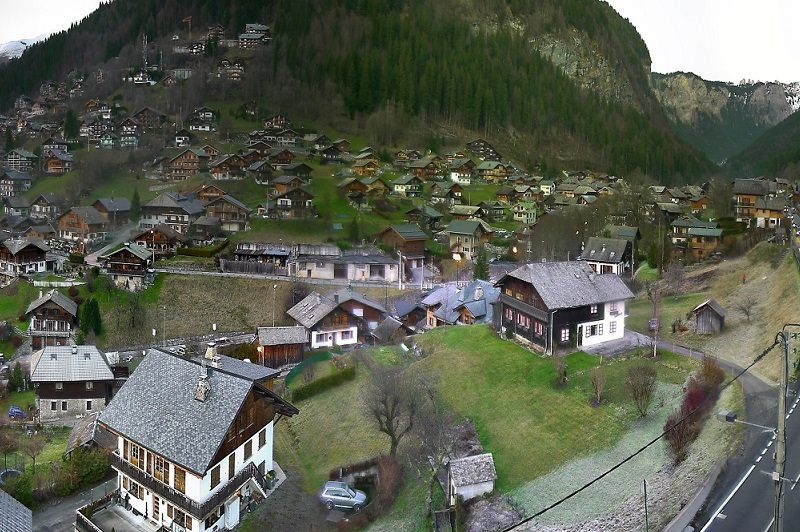 Here are some photos from ski resort saround Europe. but the village is looking a little bare !!! This time last year we were reporting over 1.5m snow base in some of the higher resorts so lets hope the snow gods are listening and send us some nice white powder soon. Ski Holidays 2014-15 - which resort will you choose ? With the ski holiday booking season starting to ramp up we thought it might be useful to take a look at some of the popular ski resorts across the Alps. France, Austria and Switzerland remain as popular as every this season. So far this year in terms of individual resorts the most enquiries have been for the resorts of Meribel, Chamonix and Val d’Isere in France, Verbier and Zermatt in Switzerland and St Anton in Austria. Check out our infographic below to see the pros and cons of these six ski resorts. Click on the image to see a larger version with all the facts. Here is a summary of the major facts and figures. Hopefully this gives you something to think about when you are planning your next ski holiday. If you need ski accommodation in these resorts we have a huge selection of chalets or ski apartments. Check out the links below to view the accommodation in each resort. Cross country skiing (also known as known as “ski de fond” in France and “langlauf” in Austria) was originally conceived as a means of transportation in the mountains of Northern Europe; however, today it has evolved into a very popular winter sport and leisure activity. Of course the alpine farmers in Austria still use their skis to get around in winter and herd their mountain goats and sheep so the original format still exists. The only difference is that instead of two homemade planks of wood, these days the farmers “ride” on Salomons, Rossignols or some other hi-tech brand. While the farmers just did it to get around, there are a number of benefits associated with cross-country skiing: everyone can master it quite easily and quickly; it provides one of the best workout opportunities; and skiers enjoy gliding over silent slopes empty of the irritating crowds of downhill riders. In comparison, the traditional downhill skiing is characterized by certain disadvantages including busy slopes, cold lifts, long waiting lines and busy expensive cafés with every seat full. Don’t get me wrong, both forms of skiing are enjoyable, just in different ways. When escaping from the hustle and bustle of the crowded downhill pistes to the peaceful environment of the lower mountains, most skiers choose either well developed cross-country routes or serene off-pistes trails. As far as routes are concerned, the majority are properly graded for distance and difficulty, thus allowing skiers of every age group to enjoy the sport for recreational as well as intense competition purposes. If you are worried about being eco-friendly then cross country is the skiing for you. Since very little infrastructure is involved in creating cross-country trails, the sport has minimum ecological effects on its surroundings. In reality you are just going for a stroll in the mountain environment with some fancy plastic tied to your feet. Cross-country skiing delivers extraordinary health benefits. Above all, it is the least risky winter mountain sport when compared with other skiing activities like downhill alpine skiing or free riding. More often than not, when planning a ski holiday people focus on the high profile French and Austrian ski resorts like Chamonix, Morzine and The 3 Valleys in France and places like St Anton, Mayrhofen and Zell am See/Kaprun in Austria. Less known skiing resorts and in fact whole countries are overlooked in favour of more popular resorts. This is a mistake as often the well known resorts offer nothing more than crowded pistes, exorbitant prices and poor quality purpose built accommodation. If you are looking for a more authentic ski holiday, what to save some money but at the same time get quality accommodation and quality skiing then you should really consider some of the less publicized resorts. One great option that is often overlooking is skiing in Italy. With alpine borders to France, Switzerland and Austria it is no surprise that Italy offers top quality skiing. Here are seven reasons that distinguish Italian ski resorts from its counterparts located in more traditional countries like France and Austria. Did you ever think of crossing the border and enjoying skiing at the same time? It is not a difficult task in Italy and even skiers with only a week’s experience are more than competent to “go international” and ski across borders. By the way don’t forget your passport !!! Low key Claviere is a small commune located on the Franco-Italian border and offers an ideal environment for “cross country” skiing. If you are staying here you are lucky because the border post is just outside your chalet or apartment. 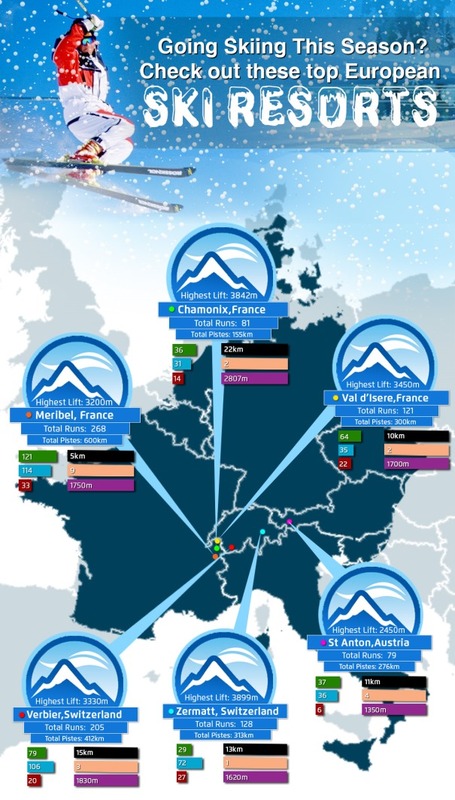 The combined lift passes for Claviere and Montgenevre (in France) will help you get the most of this ski region, which is both high in terms of altitude (good for snow cover) and perfect for beginners as well as intermediates. A word of caution though – when returning from Montgenevre you will have two routes: one, involving a very reasonable piste that runs at valley level; the second, a black run with some tricky vertical drops, so before making a choice about how to head home check your level of your energy and courage. The La Thuile lift pass also includes all the lifts and runs just across the border in La Rosiere (France). International skiing here is a matter of daily routine as the pistes are regularly interlinked across both countries, although the majority of skiers are of the view that the Italian side is the best as it faces the North and East slopes and therefore carries the best snow. Set off on your tour early in the morning, which will give you maximum time to enjoy the red runs that are located after the Napoleonic fort just at the outskirts of La Rosiere. Don’t forget to visit one of the slope side restaurants for famous ‘dejeuner en Francais’ (breakfast) before decamping for home. If you are staying in Cervinia you can reach Zermatt (Switzerland) within an hour and enjoy skiing on the slopes of Theodulgletscher yet at the same time evading the expensive Swiss costs and irritating queues for the cable cars. If you are a real skiing buff, you must kick off your journey from Cervinia right on the first lift in the wee hours to get down to Zermatt village. On returning, get in one of the mountain trains going to Gornergrat for a tasty lunch before heading back to Italy in time for tea. Keep your passport with you because the Swiss authorities regularly check it on the border! One of my favourite ski tours was a trip up from Courmayeur to ski the Vallee Blanche ending up in the heart of Chamonix town. The only cable car that heads to Punta Helbronner is presently out of order until 2015 because it is being re-fitted, therefore you will have to walk for around 30 minutes to reach the glacier. As well as getting you warmed up before skiing this way has the adding advantage of getting rid of long queues and the heart-stopping precipices on the French side. If this option down the Valle Blanche is not quite to your liking you can take a 30 minute bus trip through the Mont Blanc tunnel and enjoy a day skiing in Chamonix. One day of Chamonix skiing is often included on your Courmayeur ski package. Thrill seekers love to ski on Les Grand Montets while intermediates will be happy with Flegere and Brevent. All the three can be accessed easily on the Chamonix ski bus.